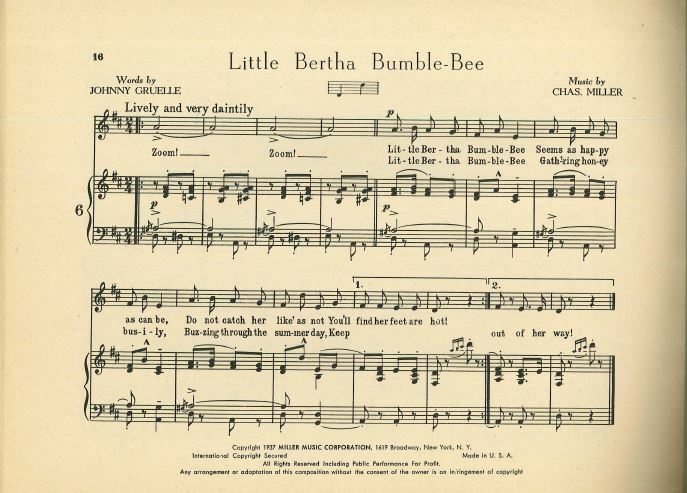 Did you know that the Indiana State Library has a collection of sheet music? We have a varied and eclectic library of scores and sheet music in our Indiana pamphlet collection. A recent visit to James Whitcomb Riley’s Lockerbie Street home reminded me that Raggedy Ann was the brainchild of Riley’s neighbor, Johnny Gruelle, an artist who lived in Indiana during most of his childhood and early adulthood. The red-haired doll’s name, Raggedy Ann, may have been based on the poem, “The Raggedy Man” by James Whitcomb Riley. I found this book of songs in our Indiana pamphlet collection. 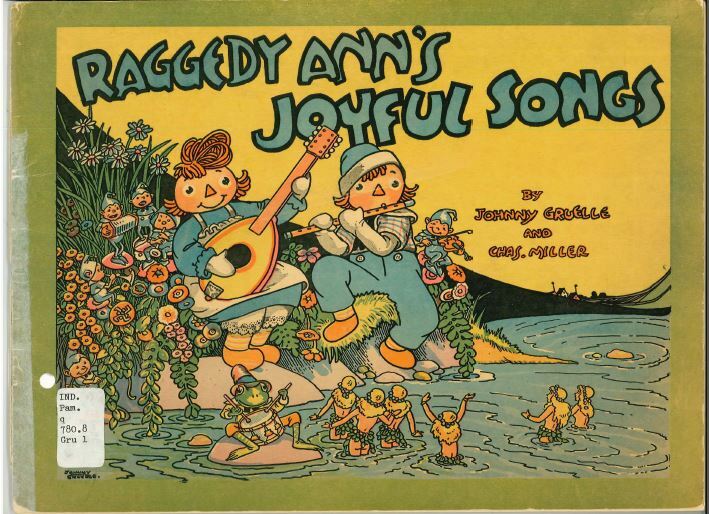 Raggedy Ann’s Joyful Songs (ISLH 780.8 Gru 1) is a collaboration of Gruelle’s artwork and lyrics and music by Charles Miller, a music composer and publisher. This is one of several collaborations between Gruelle and Miller, and the pair often worked with Will Wooden, Miller’s business partner. There were several songbooks of this type published during the 1930’s. Raggedy Ann’s Joyful Songs includes sheet music paired with cheerful pictures of Raggedy Ann and her friends. Although Johnny Gruelle was born in Arcola, Illinois in 1880, his parents moved to Gainesville, Florida shortly after his birth. When he was two or three years old, the family moved to Indianapolis, settling a few short blocks away from Lockerbie Street, where Hoosier poet James Whitcomb Riley lived. Gruelle’s father was painter, Richard Buckner (R.B.) Gruelle. R.B. Gruelle was a well-known painter in the “Hoosier Group” of painters of the late 19th and early 20th Century. James Whitcomb Riley was a frequent visitor to the Gruelle home, along with a host of other contemporary artists and writers. In 1901, Johnny married Myrtle Swann, an Indianapolis woman, whose family had lived near Johnny’s family in the Lockerbie neighborhood. They had a daughter, Marcella, who was born in 1902 and the family moved to the Irvington area on the East side of Indianapolis. Shortly after the Indianapolis Star newspaper was established, Johnny Gruelle was chosen as the first illustrator for the newspaper. 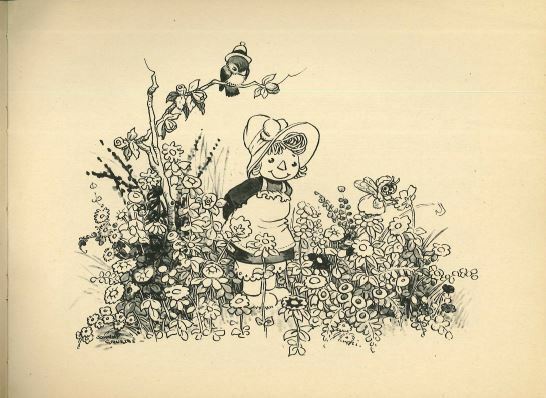 The tales of the origin of the character Raggedy Ann are unknown and varied, according to Gurelle biographer Patricia Hall in her book, Johnny Gruelle Creator of Raggedy Ann and Andy (Ind. 927 G886h, 1993). Johnny Gruelle’s wife, Myrtle, told several different versions of Johnny getting ideas for stories about a cloth doll and her friends from watching daughter Marcella play with dolls. Marcella died in 1915 after an extended illness. Family stories tell of grief-stricken Johnny keeping only one memento of Marcella in his studio: a cloth doll with scraggly hair. Although he had submitted a patent for Raggedy Ann prior to Marcella’s death, Myrtle Gruelle claims that Johnny got ideas for Raggedy Ann’s adventures from his life with Marcella and her brother, Worth. Whatever the truth of her origins, Raggedy Ann made Johnny Gruelle a world-famous artist with Indiana connections. This blog post was written by Leigh Anne Johnson, Indiana Division Newspaper Librarian, Indiana State Library. For more information, contact the Indiana Division at (317) 232-3670 or “Ask-A-Librarian” at http://www.in.gov/library/ask.htm.